Parents have to make some serious adjustments to their lifestyles when they have a kid, like changing work schedules, sleep schedules, dietary habits, and of course, their social lives. While toddlers are notorious for their ability to never sit still, they still probably can’t keep up with your morning run. In order to get some exercise while taking care of your little one, you might want to consider buying the best jogger stroller. These handy devices allow you to not only jog, but jog safely with your baby. However you might ask, how do you exactly shop for a jogger stroller that will fit your needs? Well, it’s a good thing you’ve found this article, because we are here to help you choose the perfect jogger stroller for your needs. In this article, we’ll give the run-down on eight of the best strollers you can buy to stay active. Also, we have provided a short guide on how to shop based on a number of factors. Let’s get to it! 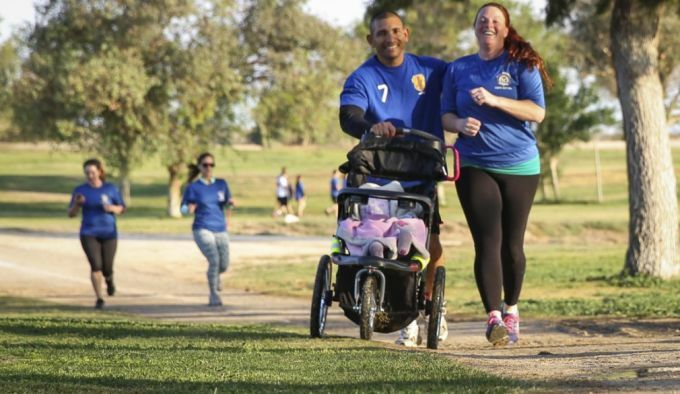 Before you buy your first (or second, or third) jogger stroller, there are some things you should consider so that you get the best fit for you baby and your lifestyle. Our first consideration is one of the most important to think about before you decide to buy any stroller – and especially one made for jogging. Although many strollers can be used or adjusted for use for kids of many ages, they are not all made the same. Many strollers are made specifically for infants, others for toddlers, and getting the wrong kind can mean the difference between a safe, happy kid and some serious boo-boos. The biggest thing to look for when determining what age group a stroller is meant for is the maximum weight capacity. Usually somewhere between 30 and 100 pounds, a weight capacity marks the highest weight that a stroller is tested safe at. If you’re kid is over the weight limit (or soon will be), consider going up a few pounds. However, the opposite usually isn’t true. Kids grow fast, and 30 pounds can become 75 pretty quick – so scaling down isn’t really advisable. Our next consideration when buying a jogging stroller is the seat style. Most strollers made for active parents have a padded seat with a harness that keeps your child safe and comfortable. Be sure to look for a secure harness, like a five-point, that will keep your kid in the seat securely no matter what kind of bumps you encounter. In addition to the safety, there are plenty of other aspects of seat style that you should pay attention to before you buy. For instance, some seats have the ability to recline, while others don’t – is your toddler a chronic napper? You might want to buy a seat that lies flat to avoid public blowups. Canopies can be removable, adjustable, or fixed – so consider if your child is easily sunburnt or irritated by the sun, or if they prefer to feel the wind a little bit more. This consideration is unique to jogging strollers. Unlike traditional strollers, joggers use a tri-wheel setup with one wheel in front. That front wheel is responsible for maneuvering and a lot of the suspension, but unfortunately, the two are at odds. For those who plan to spend most of their time off the pavement, a fixed wheel will absorb more of the shocks and keep your baby comfortable in the seat. For those who don’t plan to use their stroller exclusively off the beaten path, a swiveling wheel will give you a boost in maneuverability that’s great for use around town or in places where corners may be tight. Most swivel wheels have the option to lock, so these are generally a great option for any multi-use buyers. The next thing to look at when buying a stroller is the storability. Storing any kind of baby equipment can be a nightmare, especially when your closets are already full of unused baby shower gifts, discarded toys, or things you can’t use just yet. Having a stroller that can be stored compactly in a closet, garage, or trunk, can save you hours of tetris – and frustration. In addition to the actual space, strollers come in a variety of levels of ease for storing. Many strollers boat one-hand storage, allowing you to hold your child while putting away or taking out your item. Others offer single-step storage that reduces time and confusion – precious commodities when you’re the parent of a young child. We’ve spent a lot of time talking about what you need to think about for your baby – but what about you? Different strollers offer different options for parents to increase comfort and function, and these can be just as important as appeasing your child’s needs and security. Look for handlebars that adjust to different heights and stride lengths so you don’t end up kicking the wheels and flat-tiring yourself. Another thing to look for is accessories. Storage baskets on jogging strollers can often be limited, so things like child and parent trays can help you keep track of all the little extras that might not fit or get lost in the void of the basket. Parent trays often come with cup holders, and even special slots for wallets and phones that keep you happy and able to access everything you need at a moment’s notice. We’ve gone over some of the things that you need to consider before buying a jogging stroller, so let’s take a break from all the talking and dip into the reviews! Now that you’ve got the tools, let’s get into the products! 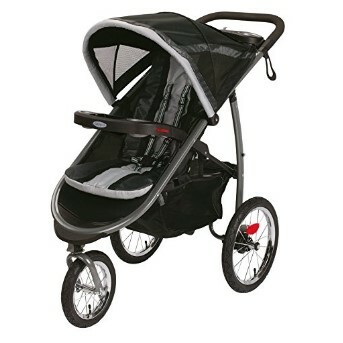 Description: For those parents who aren’t about to give up the trails, the Thule Glide Performance Jogging Stroller is there to make sure you stay outside. This stroller is built with the outdoors in mind, and features a fixed front wheel and hand brake for optimum control over all types of terrain. The fully adjustable handlebars give you a serious amount of space for some seriously long strides, or can be pulled closer to improve maneuverability through city streets and tight indoor corners. This stroller won’t just make parents happy. The seat is fully-optimized for kid comfort, including padded cushions that support up to 75 pounds. The seat reclines fully for naptime, and includes a retractable canopy with a clear screen so you can check in on the little one whenever you want. This is a perfect stroller for those who want a sturdy, reliable product without overspending – and it even comes with a limited lifetime warranty. Related: For a more heavy-duty stroller, check out the Thule Chariot Lite Cycle/Stroll – a stroller and trailer combo that can be used for running, cycling, and even skiing! Dimensions: 45 x 24.5 x 43 in. Description: The BOB Revolution Flex Lunar Jogging Stroller is your go-to for running and jogging with your baby on- and off- trail. This stroller combined the best in trail compatibility with a high standard for maneuverability and function so that you can keep your pace up in the city or in the great outdoors. Featuring a high-tech suspension system and an upright, padded seat, your baby will be comfortable over any bump in the road – and with nine different handlebar positions, you’ll be plenty comfortable, too. Not only is the Revolution comfortable, but it’s safe as well. The model features an attractive design that doubles as reflective stripping, so you’ll be safe even in low light conditions. The front wheel can be locked for better control on rough terrain, or left to swivel for better maneuvering around other runners, dogs, and cyclists in the park or on the street. This stroller is well worth its price for a high-quality product designed with safety in mind. Related: Why not use your Revolution every day – in rain or shine? Check out the BOB Revolution Weather Shield, which will keep your baby dry while you still get outside. Description: If you liked the Glide but don’t plan on getting all that rugged, the Thule Urban Glide Jogging Stroller offers the perfect alternative. This model is built for city life and paved trails, and features a swivel wheel that allows for quick maneuvering through all types of obstacles. While it has no hand brake, the stroller is lightweight enough to stop with feet alone – just 23 pounds – and includes a 5-point harness to keep your toddler strapped in safely. In addition to all the hardware, the Urban Glide has many features which will appeal to your sense of comfort as well as the little one’s. The padded seats can recline to a near flat position, and the water-resistant pads can be removed for easy washing in case of spills. The system offers full rear suspension to prevent jolts along the way – ensuring that everyone has a great time on your next jog. Related: If you’ve got two tots instead of one, Thule has you covered with the Thule Urban Glide Double Jogging Stroller, which features an extra seat and a hand brake for added control. Dimensions: 39 x 23 x 13 in. Description: The Burley Design Solstice Jogger Stroller has won several awards for it’s easy-to-use, easy-to-store, and worry-free design – and it’s easy to see why. This jogging stroller offers the best in class when it comes to frustration-free use, including one-hand seat adjustment, one-hand folding, and simple setup. The canopy is easily retractable, and even the seat is easy to use. The Solstice utilizes the patent pending S.I.T Seat technology, which prevents tangled straps and fussy kids while you try to get things figured out. Not only will this stroller save you endless frustration, but it will provide you the ultimate comfort experience, as well. Featuring a padded, adjustable handlebar, you don’t need to worry about straining to reach while you stride. While a bit heavier-weight and a bit more heavy on the wallet, the quality of this stroller is hard to match, and it comes highly recommended by kids and parents alike. Related: For high-quality protection and comfort while biking, check out the Burley Design Bee Bike Trailer – perfect addition to any cycling family. Dimensions: 47 x 21 x 41 in. Description: The Baby Trend Expedition Jogger Stroller is the perfect option for those who want a durable, customizable, and easy-to-use jogging stroller without breaking the bank. This stroller features a front wheel that swivels freely or locks in place – allowing you to master bumpy trails or get around town with minimal hassle. The foot rests feature light reflectors for extra safety during low-light, as well as an adjustable five-point harness to prevent accidental spills. Toddler spills aren’t the only kind the Expedition prevents – it comes with a removal parent tray with two cup holder slots so you can store your water, coffee, or any other drink you fancy on your jog. Baby Trend knows that your comfort is only as good as your child’s, so they designed this stroller with an extra padded, fully-reclinable seat and adjustable canopy so that you can customize your kid’s experience, as well. This is a great product for casual runners or those who want an intro to the jogging stroller world. Related: The Expedition is compatible with Baby Trend car seats, so why not check out the Baby Trend Flex Loc Infant Car Seat – a perfect way to seamlessly transfer between car and stroller. Dimensions: 24 x 40 x 42 in. Description: If you’re not the type to go barreling down gravelly trails or boulder-studded backcountry, the Graco Fastaction Fold Jogger Stroller is the stroller for you. This item offers a ton of features designed to make your life easier, like one-hand folding technology, an automatic storage lock, and the ability to free-stand while folded. The parent tray includes cup holders and a specially designed smart phone slot so you don’t lose track of anything on the go. You can rest even more easy knowing your baby is safe with side reflectors for low light and a convertible 3- or 5-point harness. In addition to your comfort, the Fastaction takes your kid into mind. The stroller features a padded, multi-position reclining seat that can be adjusted to the perfect spot, as well as an extra-large canopy to keep our direct sun from all angles. The wheel can be locked for added control on rough terrain – but this is a stroller best suited to small kids and easy terrain. In any case, it’s a high-quality product that will keep you and your baby satisfied. Related: For even more outdoor fun, check out the Graco Play ‘n Pack On the Go Playard Stratus. This portable play enclosure is perfect for trips to the park. Dimensions: 19 x 32.5 x 42 in. Description: The Baby Jogger Vue Stroller may not be a traditional jogging stroller, but it’s got plenty of features to keep you and your baby happy on paved terrain, no matter where you go. This lightweight stroller features four double wheels for added control, as well as separate handlebars that can adjust to your height easily. In fact, everything about this stroller is easy – the Vue allows you to adjust the canopy, seat direction, and seat recline with just one hand, and in less than three seconds! This stroller comes with protection of all kinds. The five point harness keeps your baby safe and secure in the seat, while the canopy blocks sun at 50+ SPF for protection against eye damage and sunburns. The most unique feature of this stroller is the ability to switch between outward-facing and parent-facing in a matter of seconds, with just one hand. This stroller is an affordable, convenient, and comfortable option for the townie parent. Related: For a heartier jogging stroller, check out the Baby Jogger City Mini GT Stroller, which features more suspension and a sleeker design. Dimensions: 40.5 x 22 x 42 in. Description: The Costzon Baby Jogger Stroller is the perfect lightweight stroller for those with young children who don’t want to give up their active lifestyle. This stroller weighs only 22 pounds, allowing for jogging and running without pushing a ton of extra weight. The front wheel swivels or locks, allowing you the best of both worlds when it comes to terrain – let loose on the dirt or stick around town with the same amount of ease, knowing your child is safe in the five-point harness. The canopy and seat in the Costzon are fully adjustable, and the canopy is even removable, meaning you can customize to your child’s ever-changing comfort needs with ease. If the bottom storage basket doesn’t have enough room, the handlebar offers cup holders, and the removable child tray can hold small cups and toys as well. This is a great, affordable option for those who want to get outdoors without worrying about bumps in the road. Related: If you want to make your outdoor experience even more special, check out the Costzon Hanging Tent Nook. Use it indoor or out to make a perfect chill spot! We’ve gone over eight of the best jogging strollers on the market today, as well as what you need to know before you decide to buy one. Don’t let being a parent keep you from your active lifestyle! What are your favorite outdoor activities with your kids? Have a comment on any of these products we’ve listed? We’d love to hear from you, so please let us know what you think in the comments section below.